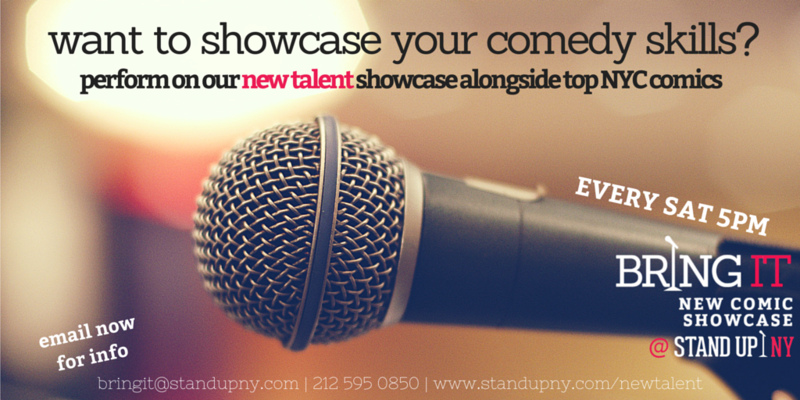 Do you have dreams of becoming a Stand-Up Comedian? If you answered yes, then come “Bring It”. Stand UP NY has the perfect opportunity for up and coming comics to stand up and show New York, friends, and family what you’ve got with our new show “Bring It” every Saturday at the prime time of 5PM. This house show will include pro and new talent comics, which calls for the perfect mix of performances. “Bring It” is a great opportunity for amateur comics to a that has already helped many comedians get on their feet. The line-up will include new talent comic, MC and 5 pro comics like Godfrey, Chris Distefano, Greer Barnes, Ari Shaffir, Damien Lemon + more! The show will run for 1.5 hours keeping all guests energized, supportive, and alert! The club requirement for any comedian to perform is to have 8 or more people attend the show in their name*. This is the best way to create a large audience and give new comics more exposure. For this show, there will be a reduced cover and drink specials every week for anyone that attends. So, whether you’re an up and coming comic looking for experience or someone who loves being exposed to stand-up; come on down to Stand Up NY and BRING IT.